All members of the Swanton Community are invited to participate in the second phase of the Vermont Council on Rural Development’s (VCRD) Community Visit to the Swanton. The meeting, to be held on Thursday March 5 6:30 – 9:00pm at the Swanton Village Offices, will follow up on the initial session held in January, which drew over 185 community members. During the day of forums on January 28th, residents met in focus groups to share their thoughts on topics of relevance in Swanton including: Vibrant Downtown, Swanton’s History and Culture, Tourism Waters and Wildlife, Community Recreation Facilities, Education and Training, Community Health and Substance Abuse, The Future of Agricultural Opportunities, Growth and Development, and Jobs and Economic Opportunity. A Visiting Team of 25 representatives from state, federal, private, non-profit, and philanthropic agencies heard their ideas, and will remain as resources as the town moves forward on priorities that emerge through this process. The March 5th meeting will center on reviewing a list of ideas generated at the first visit day in January. VCRD will facilitate a discussion of those ideas, where members of the Swanton community will advocate for causes of particular interest, and finally vote for issues they want to move forward in the coming year. The issues that are selected will become the focus of task forces in the future. In April, VCRD will return with a resource team of state, federal, and non-profit leaders for a final visit to help the new task forces build action plans and resource connections to advance the priority projects. All residents, whether they participated in the first session or not, are encouraged to come out on March 5th to vote for issues that will become the focus of working groups in the coming year. 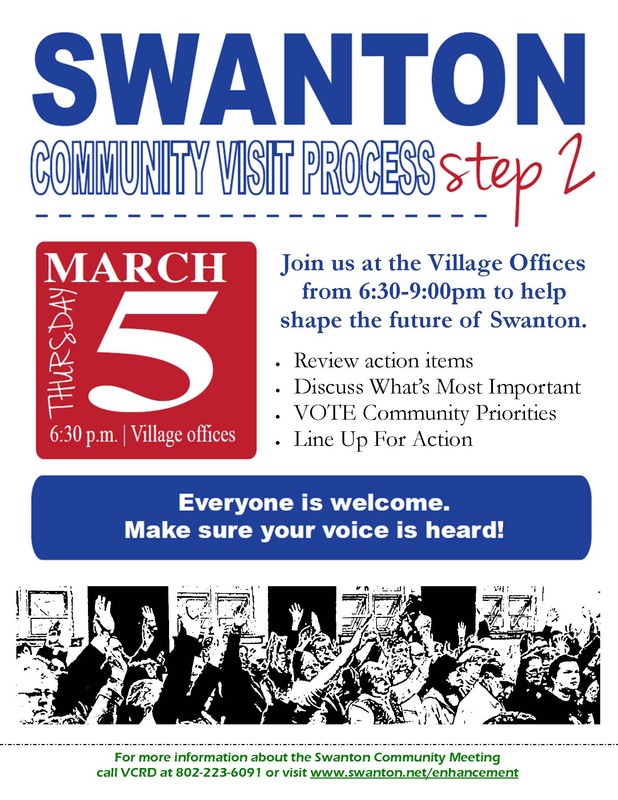 Mark your calendars and come play an active role in shaping Swanton’s future. The Vermont Council on Rural Development is a non-profit, non-partisan organization dedicated to advancing rural Vermont communities. For more information, contact Margaret at 802-223-6091 or info@vtrural.org or, for more information on the process go to: http://vtrural.org/programs/Community-Visits.